Excellus BlueCross BlueShield has recognized Upstate University Hospital’s Community Campus with a Blue Distinction® Center for Maternity Care designation as part of the Blue Distinction Specialty Care program. Blue Distinction Centers are nationally designated hospitals that show expertise in delivering improved patient safety and better health outcomes, based on objective measures that were developed with input from the medical community. This is the second time the Community Campus has earned this designation as it was also recognized in 2016. Nearly four million babies are born in the United States annually, making childbirth the most common cause of hospitalization, and cesarean sections the most common operating room procedures, according to National Centers for Health Statistics and the Agency for Health care Research & Quality (AHRQ). Reducing early elective delivery is an area of focus for the American College of Obstetricians and Gynecologists (ACOG) and the American Academy of Pediatrics (AAP). According to Health Affairs, elective inductions result in more cesarean deliveries and a longer maternal hospitalization. 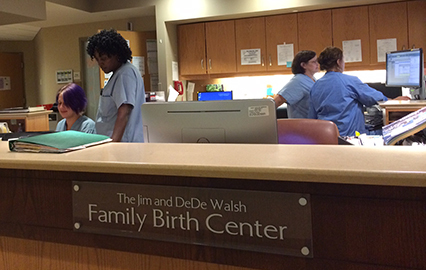 The Blue Distinction Centers for Maternity Care program evaluates hospitals on quality measures for vaginal and cesarean delivery. “This recognition from Excellus BlueCross BlueShield reflects the priority the Community Campus places on patient safety and quality health care,” said Laurie Fegley, RN, BSN, nurse manager of the Family Birth Center. The Family Birth Center offers a wide range of services for parents and infants and was recently recognized as a Gold Safe Sleep Center, highlighting its adherence to safe sleep guidelines set forth by the American Academy of Pediatrics. The maternity unit and nursery at Community are undergoing major renovations that will culminate in a large, warm, and welcoming place featuring amenities that will enhance the first days of life. The construction plan calls for a state-of-the art nursery and large, private rooms with bathrooms to encourage family members to spend quality time together. Renovations should be complete by late summer.